I've been half-trying to save this post for July 24th (because that's national cousin's day, btw) but I don't really feel like waiting that long because I am not patient. So here we go! 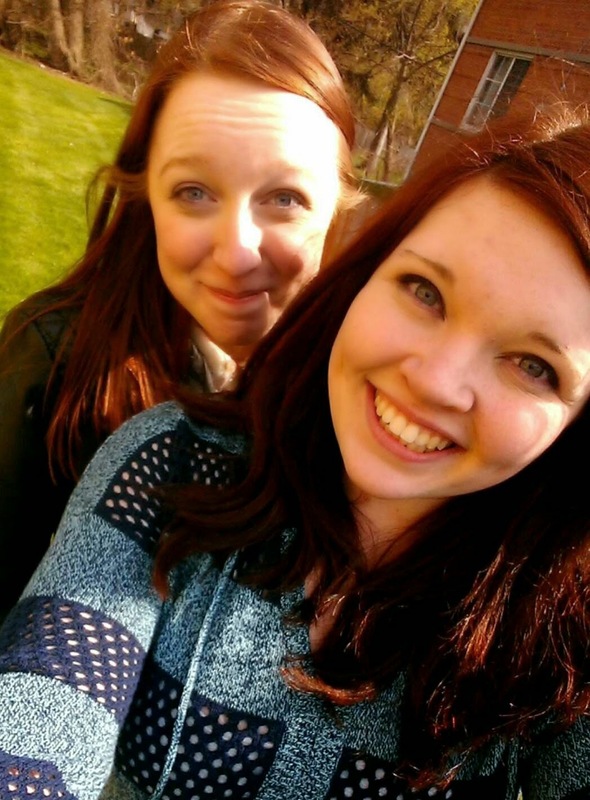 This is me (right) and my cousin, Cassidy (left). You may recognize her from her pinterest account. If you don't, go follow her! Anyway, if you remember me ever mentioning my cousin in some of my other blog posts, I was talking about this lovely lady right here. Cassidy and I are the same age (okay, she's four months older, whatevs) and we've gotten insanely close over the past few years. What began as only seeing each other for family gatherings every six or so months has now blossomed into a 24/7 text messaging plus a caffiene-induced-sleepover-once-a-month-friendship. And the best part? Cassidy is a writer, too. When I first began writing Unperfected, I looked for inspiration on Pinterest a lot. That's when I first noticed my cousin's pins; snippets of her writing from her own book. And my gosh, it was good. Her words were so incredibly beautiful I could hardly believe someone my age had written them. So, I commented on one of her pins. And then she commented back. And then I texted her, and she texted back. And we kept talking about her book and my book, and now we seriously text 24/7. I never thought that getting closer with Cassidy would have such a big impact on my writing life, but it seriously has. 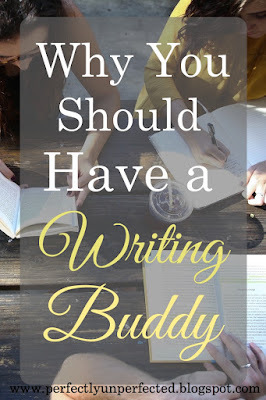 Talking with her and hanging out with her over the past few years has taught me a thing or two about the joys of having a writing buddy, and I wanted to share what I've learned! 1. You have someone who truly understands. Talking with your mom or friend about your book is great, but have they ever given you a weird look or questioned something that would make perfect sense to another writer? That's why having a writing buddy is so great. They understand the mind of a writer, because they have the mind of a writer. It's amazing what a difference I've seen when I explain my story to my mom compared to when I explain it to Cassidy. My mom encourages me of course, but the moment I mention I'm killing a character she goes "What? Why? That's awful!" whereas Cassidy or my other writing friends simply go, "YES." 2. You have someone to push you. I think it's safe to say that I am a major procrastinator. There have been tons of times when I needed to write, but wouldn't simply because I was too lazy or didn't feel like it. And that is when Cassidy would come in and bug me to to get the writing done, pushing me and motivating me until I finally would just do it. And when it was finished, she'd read it and give me feedback. Which brings me to my next point! 3. You have someone to critique you. This is relatively new for me and Cassidy, but I'm really glad it's something we've begun doing. As we edit our books/write new material, we e-mail each other and swap writing. Not only does it give our eyes and minds a break from reading our own writing, but it helps us mature as writers and readers. Cassidy has been able to catch mistakes in my work that I would never, ever catch, and she's brought light to things I never thought needed fixing, but do. Having a writing buddy who is willing to critique your work and give you honest feedback will ultimately help you grow as writer and learn new things about your own words. 4. You have someone to encourage you. Writing is a tough business, and sometimes, it can be really overwhelming. Sometimes I wonder if I'll ever finish the book I'm working on. Sometimes I wonder if I'll ever get published. 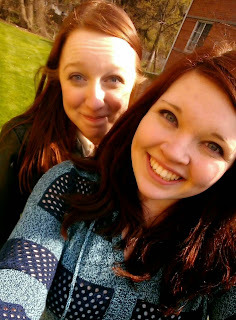 And when I find myself drowning in fear of the future, Cassidy is always there to pull me back to the surface. She and I always get into long and serious talks about the world at the most random times, and a lot of these talks consist of our publishing and writing fears. I have a bunch of encouraging texts from her saved in my phone, and when I need a confidence boost, I go back and reread them. Having a writing buddy is truly an amazing and helpful thing, and I'm lucky that my writing buddy is also family. But if you don't have a cousin or close friend like Cassidy, no worries! There are plenty of other ways you can get yourself a writing buddy. Pinterest has a whole community of writers of all ages, sharing and pinning ideas. I've seen tons of friendships bloom on that site, leading to a writing buddy relationship similar to mine and Cassidy's. There's also blogs, such as Go Teen Writers, as well as the Go Teen Writers facebook group, where you can get in touch with a bunch of writers like you. No matter where you are or how you meet, finding a writing buddy is a super great way to grow as a writer, and also create a lasting friendship.